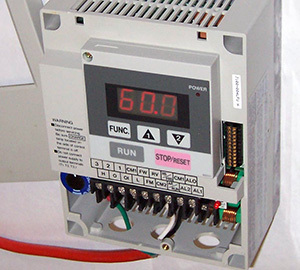 Variable frequency drives (VFDs) control the speed of pumps to optimize energy efficiency. In short, they can run the pump at more than one speed. A traditional pump motor is run at a preset speed. On the other hand, a VFD cycles down the revolution, lowering the speed and moderating energy use to achieve the desired flow. The drive adjusts the speed of the pump motor depending on the pool conditions. The pump slows to produce the flow rate that complements the filters capabilities. When demand is low, the speed can be adjusted to lower rates. When demand is high, the motor can be sped up. Adding a VFD can lower costs and noise made by the pump motor. In addition, with VFDs, motors can be ramped down and up, eliminating the need for hard stops and starts that cause electrical surges. However, a VFD may need to be calibrated so that it does not slow the pump to below rates that are acceptable by local health departments.